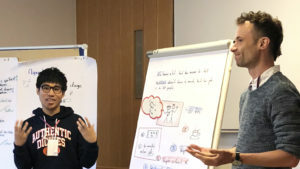 In an intense and inspiring three-day workshop in Vienna/Austria, the social and environmental justice Twinners were provided with a training of rhetoric skills and input from local NGO experts. The meeting was also an opportunity to reflect on the experiences made so far and to network within the group and with alumni Twinners. 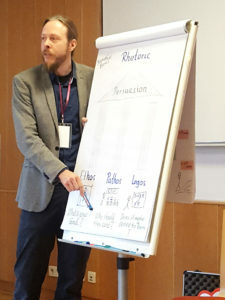 Day one started with a rhetoric workshop held by Moritz Meyer from the University of Hamburg. Three Twinning pairs were given the opportunity to improve their presentation skills in order to better convey the content, focus and intention of their work to specific audiences. They were asked to present their exchange experience and joint projects to the group. Through several rounds of feedback, they identified strong points and flaws and mapped out opportunities for improvement. 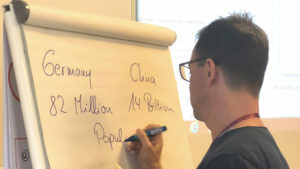 Moritz highlighted, that when designing a presentation, one should think not only about the logic and content, but also about the goal and intention of the presentation (Ethos) and about a way to make the audience care about the cause (Pathos). 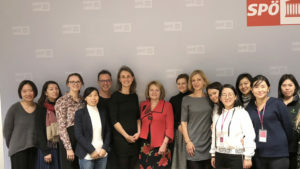 In the afternoon, Twinning Alumni Louisa (Forum Theater Enschede, Netherlands) and Georgeta Mureanu (FCASEC/Romania) presented their follow-up project with Chinese partner Evergreen – a 2016 festival on Non-formal Education Theatre in Beijing. Day two of the workshop started with a visit at the office of Mrs. Ruth Becher, MP and member of the Austrian Social Democrats Party, SPÖ. A spokesperson on housing and construction, Mrs. Becher answered numerous questions on the topics of her expertise. When asked about current housing issues in Austria, she explained that as most countries, Austria is facing the global trend of urbanization, an issue the Chinese participants were especially interested in. Vienna being the main magnet for Austrians and people from all over the world. With more than 30.000 people moving to the Austrian capital each year, there is a growing demand for newly constructed and affordable housing. Until now, housing law allowed for a high percentage of social housing, that is also available for people with average middle class financial resources. However, the SPÖ is currently opposing a proposed EU-guideline, which foresees stricter income checks for tenants of social housing, thus preventing people from the middle class from renting the affordable social housing apartments. This guideline might endanger the healthy mix of tenants from all social strata and favor parallel societies. Mag. Becher also explained that sustainable construction, e.g. with regard to heating, is a precondition for receiving government subsidies in housing construction. Regarding environmental protection and Green projects in Vienna, the MP highlighted, that with new construction, sealed surfaces can only make up one third of the whole space designated – two thirds have to remain green space. Moreover, every tree larger than 40cm in diameter in Vienna is registered and protected. Even when they grow in private gardens, they cannot be cut down without permission from the municipal administration and adequate replacement greenery. On waste management in Vienna, Mrs. Becher explained that waste separation is compulsory in the city. The city’s incinerator in Spittelau functions as a waste-to-energy-generator, providing around 60.000 apartments with heating. In her eyes, the incinerator was very much accepted among city dwellers. At the same time, the air quality and pollutants are constantly being monitored using sensors throughout the city, with the data being made available to all via an app. 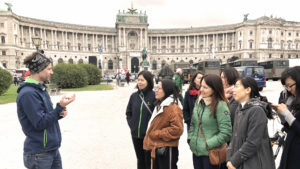 The field trip concluded with a tour around Vienna’s most important historical sites and buildings, with our very own Twinning participant Matthias Haberl (Südwind Austria) as a fun and knowledgeable tour guide. Day two opened with welcome remarks by Stiftung Asienhaus’ Nora Sausmikat and Joanna Klabisch as well as by Wang Xiangyi from CANGO and Judith Christ from Robert Bosch Stiftung. 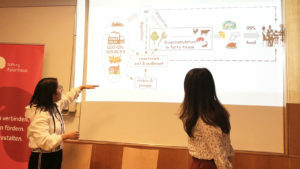 The second workshop day featured the refined presentations by the three Twinning groups as well as inputs from sustainable mobility expert Holger Heinfellner and non-profit organization consultant Nina Thüllen. First, Holger Heinfellner from the Austrian Environmental Agency talked about the environmental impact of mobility. He highlighted the importance of the transportation sector for all efforts to cut Green House Gas emissions and fight climate change. His institution is tasked with developing a strategy to shape a sustainable Austrian transportation system and thus help the country to reach their carbon reduction goals. They have so far devised several measures in the three action fields of avoiding, shifting and improving transport. In order to avoid transport, consumer behavior needs to be changed. At the same time the local economy is to be strengthened, as well as structures and modes of work that require little mobility, such as teleworking or teleconferencing. Shifting transportation points to developing infrastructure for more active mobility, such as cycling and walking and offering high quality public transportation, while taking space away from cars. Improving transportation is related to those trips, that can neither be avoided nor shifted to more sustainable transportation modes. These trips should be taken by vehicles and with fuels with the highest energy and resource efficiency and the lowest emissions, such as battery electric vehicles (BEV) or biofuel-run vehicles. 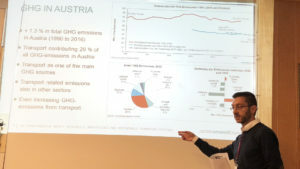 According to Mr. Heinfellner, NGOs are active in all three fields of shaping a sustainable mobility system, such as the VCÖ (Mobilität mit Zukunft), advocating an environmentally and socially just transportation system, or the cyclists’ and pedestrian lobby associations. Mr. Heinfellner also pointed out that civil society organizations in Austria are confronted with shrinking spaces under the current conservative/far right government coalition. The main concern for environmental NGOs at the moment is a regulatory initiative, that would prevent environmental organizations with less than 100 members to be involved in environmental impact assessments. The initiative also requires all member’s full names and addresses to be provided to the environmental ministry, which many think to be a clear violation of privacy law. 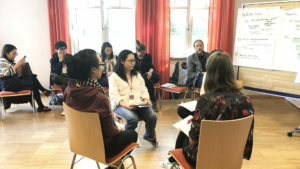 The Twinners, most of whom worked in big or in China’s case so called mega-cities could relate to many of the presented issues and a lively discussion on the topics mentioned took place after the input. A short summary of the presentation can be found here. Mr. Heinfellner’s talk was followed by an input by Nina Thüllen, a system consultant working on empowering non-profit organizations. Nina invited the workshop participants to make use of her wide expertise of developing campaigns and NGO work on EU and an international level. 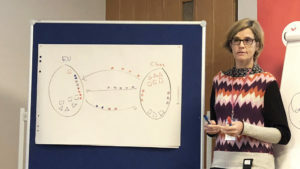 As a start, she briefly outlined and visualized the law-making process on EU-level, indicating possible points of involvement for non-profit organizations. Taking Chinese-European trade relations as an example, she identified several points of involvement for European and Chinese non-profit organizations. They could lobby for similar standards regarding workers and environmental rights. 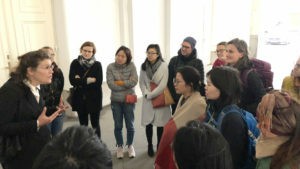 In Europe, one method would be to appeal to people’s morale by exposing the situation of workers and the environmental impact of cheap production methods in China. Chinese organizations could contribute by providing pictures, videos or suitable stories relating to the joint venture productions. Moreover, with the help of a European partner organization, they could identify Members of the European Parliament working on the related topic, and send them information. With regard to planning a campaign, Nina recommended http://campaignstrategy.org/, an online guide for successful non-profit campaigns. When designing a campaign, one should first define the goal, then spend sufficient time on context and stakeholder/power analysis, build the strategy accordingly and design tactics as a last step. The talk was highly interactive and the Twinners appreciated the practical approach to campaigning/lobbying Nina advised them on. At the end of the day an informal networking get together with visitors of the workshop concluded the event. 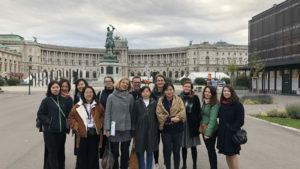 The last day of the Vienna Capacity Building and Reflection Workshop started early at the Heldenplatz (Vienna Centre), where Barbara awaited the Twinners for a very special kind of city tour. Shades Tours a Viennese social enterprise, organizes moving tours guided by homeless people. Because, who else could explain this difficult topic and its issues better than those affected themselves. Meeting Barbara, a former art gallery owner who lost her business as well as her housing after incurring a substantial debt through medical bills immediately confronted the participants with their preconceptions of homeless people. While walking along the splendor of the Austrian Parliament Barbara explained backgrounds of homelessness, the statistics of it in Vienna, the social system supporting homeless people in the city and ways of recovery. While the rain forced the group into the warmth of the beautiful Viennese Café Mozart, the discussion was not hindered at all through the relocation. Barbara’s honest and personal approach to the topic abolished all shy reluctance and the group was left with a completely new perspective of Vienna and the Austrian social system. The last stop of the day was a visit to Südwind Austria. The organization’s sub-group Südwind Niederöstereich is taking part in this year’s Twinning with their partner the Labor Education and Service Network Hongkong. The highly professionalized and successful pairing provideda lot of local support to the Vienna workshop organizers. Visiting their office space in the city center and talking about one of their many programs cemented the thoroughly positive picture the Twinners gained of Südwind. 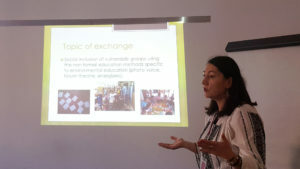 The organization gave an input on an environmental education program they are running in schools all over Austria: Training teachers on climate change issues and providing material that many schools are lacking. Starting environmentally conscious behaviors in young children is one of the best ways to ensure sustainable attitudes in them as well as their parents. Following the environmental input Matthias Haberl and his Twinner Kin Wan invited all to join their planned online platform dealing with global labor issues. An invitation that the Stiftung Asienhaus is sure to follow. We thank all participants for taking part in these three days full of learning, networking and reflection on the EU-China NGO Twinning and hope to see you again. Posted in: Allgemein, Twinning News 2018, Workshops. Tagged: 2018, Civil Society, Cooperation, Environment, Environmental Protection, EU-China Twinning, Vienna, workshop.